This is the race I have been training for and thinking about all summer. My running interests have changed drastically since last summer after my first hairy trail run and my subsequent introduction to the “Geasers”. I no longer solely to keep in shape and stay active, but now I mostly run in order to see and experience as much wilderness and backcountry Alaska as I possibly can. The amount of ground covered and peaks summitted and I am still home for lunch….or maybe afternoon tea….and it would have taken the average hiker a full day or several days to complete the same amount of distance. Amazing. Now, a little information on “The Smokin’ Ole Geasers”: They are a sub-group within the local running community. A group of men who know the mountains of Juneau like the backs of their hands. They are fast and these guys love adventure and live for an adventure on the trail in ANY season. They will sit for hours telling stories of adventures and races from the past, reminiscing about past geasers who have moved on, and harassing each other mercilessly. The meet every sunday without fail to run at 0730, rotating weeks between downtown and the valley … they run in the sun, the sideways rain and the sub-zero temperatures, then eat breakfast together afterwards. They are a hoot to be around and they are my tour guides to the Juneau wilderness. 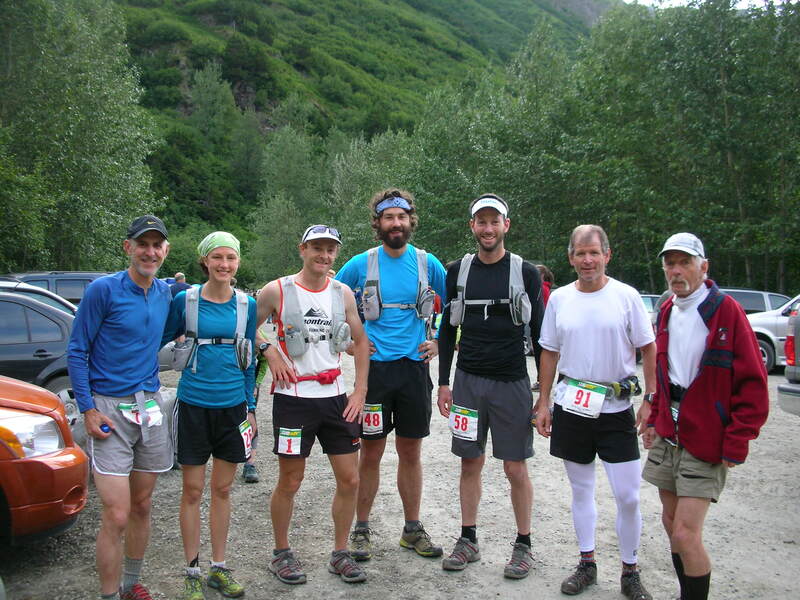 I have learned so much from them about the local trails, the backcountry, trail-running, and the history of Juneau. I can keep up with them running and in snow-shoes, but forget skiing! They ski the pants off me in both classic and skate-skiing. The morning of Crow Pass was sunny and clear, and reportedly the trail conditions were one of the best in history. The course started out by climbing over 2000 ft in 2 miles immediately from the starting line. At the top of the pass, the trail leveled off and crossed over rock scree and a small amount of snow before beginning to descend to the Eagle River. The trail was all single-track, rocky, rooty, and much of the trail going through long grassy meadows in which grass, indian rhubarb and ferns hung over the trail obscuring the view. There was no bridge at the river and we had to run/wade through it. Due to warm tempertures in the preceeding days before the race, there was a lot of snow melt and the glacier-melt river was waist high and had a good strong current. After the river crossing, there was 12 more miles of single track narly trail to the finish. It was beautiful country and I kept forcing myself to glimpse up for a quick look at the surrounding scenery before once again concentrating on the trail before me. I felt like I ran well, but if I could have trained differently I would have run more of the longer & flater trails in town rather than focasing so much on uphill train running. There was only the initial climb and the rest of the race required steady endurance. My time of 3:50 was the winning time for the women in last year’s race; however, there were other fast rookie women who showed up this year and I placed fourth overall for women. 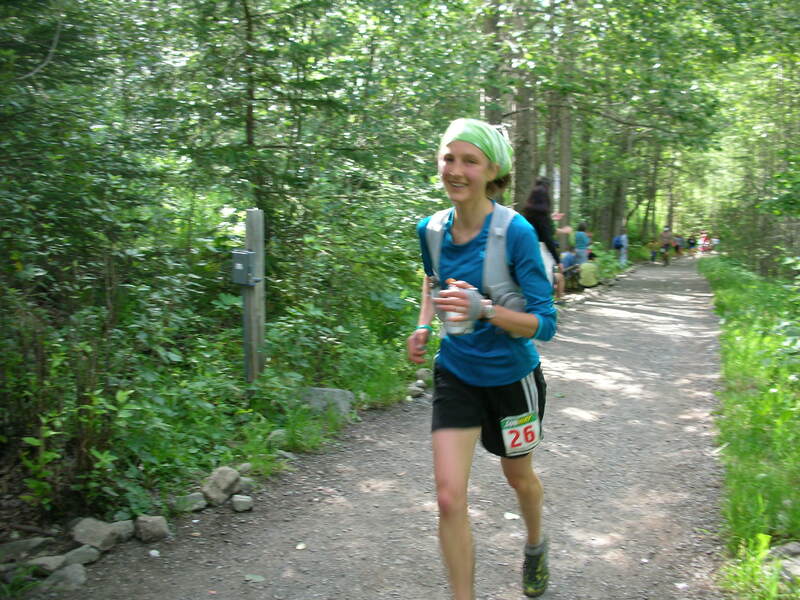 My thoughts after the race vascilate between wanting to go back next year to run it faster and stronger, or simply running it for fun next time I happen to be in Anchorage. These geasers are very influential….I say that I am done racing until I listen to them talk about their up-coming races and they are always asking me about what I am going to race next. 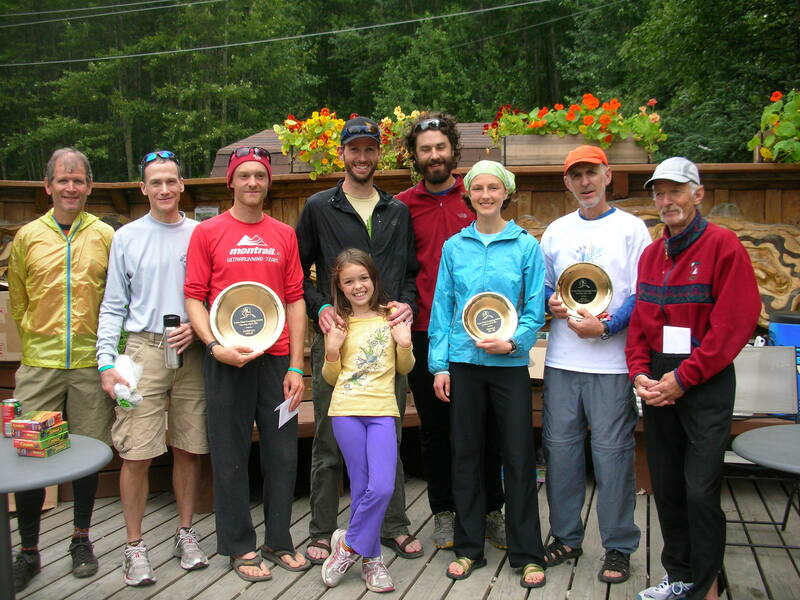 And then there was my goal for 2011 to run a 50-miler somewhere…..
Juneau “Geasers” after the race and some awards. Wow! Rachel you inspire me! I just wish I could go for walks right now. My PT is going slower than I’d like, but hopefully I’ll have a breakthrough soon. If not, I go see an orthopedic Dr. Keep up the great work!